1) This was created using one of my new favorite colors for the summer – Wet ‘n’ Wild Megalast Salon Nail Color in I Need A Re-Fresh Mint (this is slightly darker than your standard mint shade, and has more of a blue/turquoise undertone – totally reminds me of the ocean!). This is three coats, followed by one coat of Seche Vite Fast Dry Top Coat. House of Harlow 1960 14KT Horseshoe Stack Ring in Yellow Gold. P.S. This is one of Wet ‘n’ Wild’s newer shades, so it has the Manicurve Pro Brush, which is beyond awesome and makes application super simple! 2) To get this look I used Sinful Colors Professional Nail Enamel in 24/7 – this is a really fun neon pink that is actually even brighter in person; it would look incredible for summer pedicures. This is three coats, topped with one coat of Seche Vite Fast Dry Top Coat for added shine. Arrow Connector Ring via Forever 21. 3) To create this lacquer look I used Essie’s Mademoiselle (thank you to Theresa of despising life is so passé. who sent it to me!). This is supposed to be a sheer pink color, but I wanted it to be a bit opaque, so I used four coats here, and one coat of Seche Vite Fast Dry Top Coat. Stackable Ring via Forever 21. 4) Here I used Sinful Colors Professional Nail Enamel in Cinderella. You can’t see it in the picture (as hard as I tried to capture it), but this color actually has pink microglitter mixed in, so you really get that shimmery, Cinderella slipper look which is beyond gorgeous in person. This is three coats, topped with one coat of Seche Vite Fast Dry Top Coat. 8 7/8 Carat Smokey Quartz & Sky Blue Topaz Sterling Silver Ring. I have #1 nail polish and its one of my favorites! These are so cool. I tried megalast's private viewing, but couldn't get used to the color. I like Sally Hansen's Limestone! Awesome! I love the pinks! Great post! I love when you do this. I want to wear yellow, but I look better in greens and blues. loving #1 and #2... great post! I am so loving that pink nail polish! I have that same minty green polish and it is awesome. i am loving all of these colors. and the rings! My nails are naked today! I have the day off so I'm giving them a break. I love the sheer pink. So feminine! And I love that arrow ring! I Need a Re-fresh Mint is my fave. I like #2 as well. Gorgeous colors, especially that teal! The 3rd ring actually looks somewhat similar to Yurman!!! Loving these nail shades. The first one is such a pretty colour. I'm rocking a deep green on my nails today. I'm definitely loving the refresh mint color on you and may have to get my own bottle! that's a wet and wild color? you don't say! looks so high end. 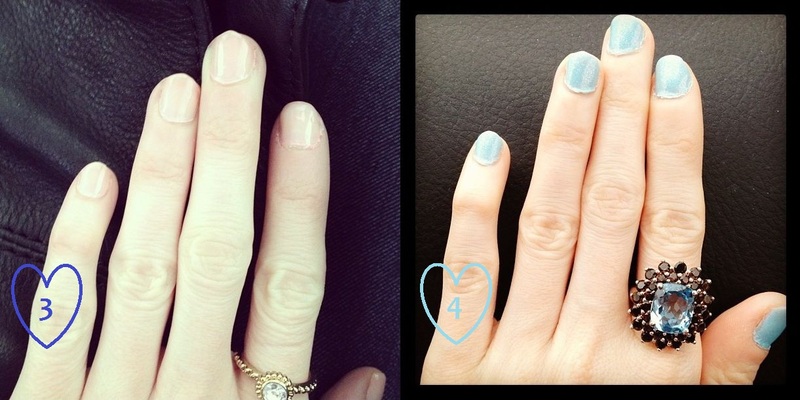 I seriously love how you spend so much time on your nails0 always looks great. I wish I had the energy. Quite lovely! I'm going with #2. I love bright pinks for warm weather...or cold. 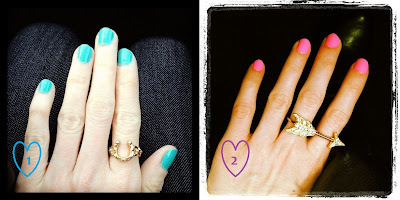 I love the whole second look, from the ring to the nail color!